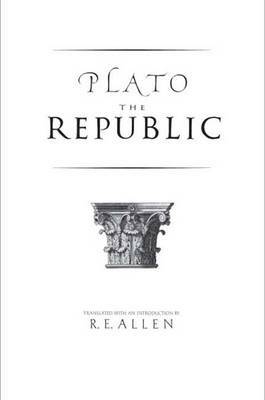 R. E. Allen's highly regarded translations of the dialogues of Plato have been praised for their faithfulness and readability. Many years in the making, his translation of The Republic has been eagerly awaited. It comes now to crown a distinguished classicist's efforts to make Plato's works available in readable and accurate translations. This new, lucid translation of Plato's greatest dialogue is the first major translation in English since the publication of F. M. Cornford's and G. M. A. Grube's renditions more than a generation ago. It is likely to be the standard translation for years to come. This edition, intended for the student and general reader, is accompanied by Allen's notes and introduction. The Republic is, of course, many things: metaphysics and epistemology, moral psychology and ethics, educational theory and aesthetics, and poetry and eschatology. In his introduction, Allen takes up its threshold question-the political-and argues that its particular formulation by Plato had a direct and profound influence on the Founding Fathers and the development of American constitutional law.